Going to the movies out in town is always a treat for all ages. However, more and more people want to enjoy a similar experience in the comfort of their home. Initially, the home theater was meant to imitate the emotion and excitement of going to a regular movie theater. But modern technology manages to exceed its initial source of inspiration in terms of the quality of experience. Many readers ask us about home theater design ideas, pictures, or diy options. Even if a professional home theater can cost about 6 million dollars, you don’t have to pay that much! The way you decorate your home theater is equally as important as having a great home theater system in the first place. 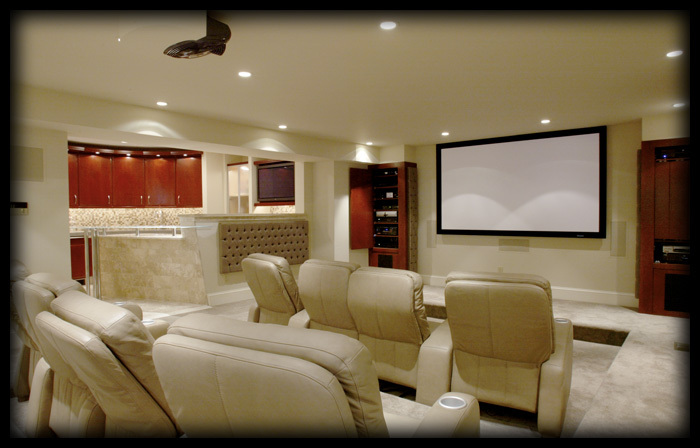 Here are some home theater design ideas that show how easily you can improve the entertainment spot in your house! 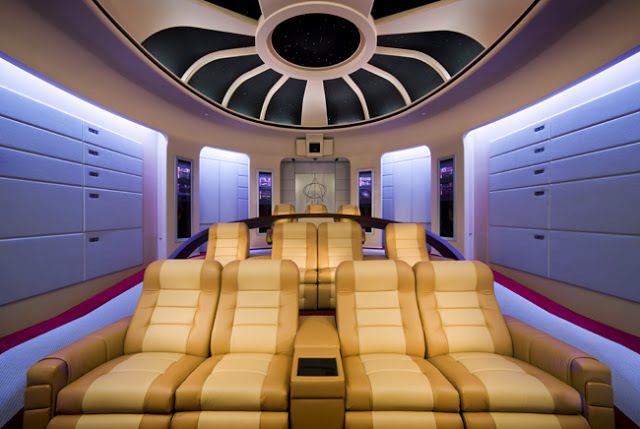 The white leather bound home theater in the picture below has a bar as well, to make sure no one longs for a drink during the movie. We must admit that it looks pretty neat. Even though this home theater design is classic, it’s not boring at all. Actually, no home theater design can get too old-fashioned, since owning one is still something exotic. 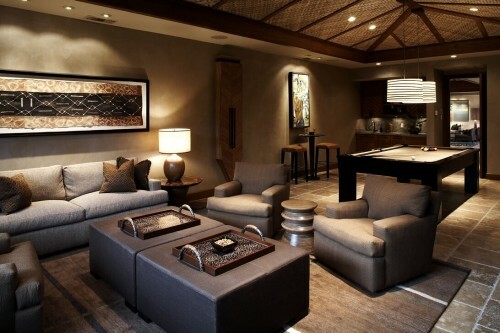 Other functional ideas which you could incorporate into your home theater setting are: making the place double as a relaxing lounge, a cookie bar, a pool parlor, or a library or collector’s display. Thus, you can put all your precious assets in the spotlight, right in the home theater. As you see, there are many possibilities of doubling your home theater with a functional space. The easiest way to enhance that almost mystical aura of a home theater setting is to add a theme, and a story to the space. Possible themes to consider are various, basically whatever suits your fancy. What could be nicer than walking around through your own home movie theater, and getting into the atmosphere of your favorite movie? 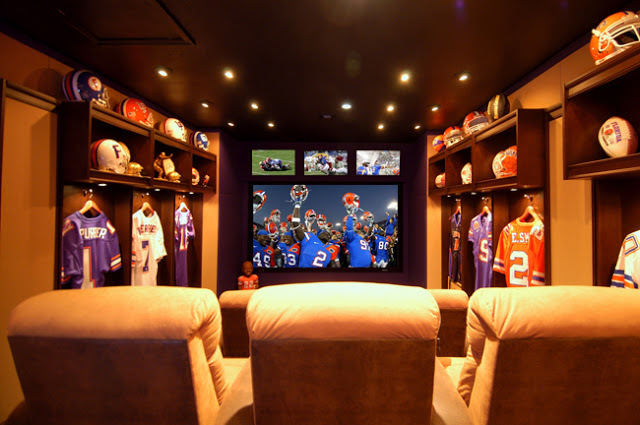 Examples of such thematic home theater designs are: a football fan dressing (picture below), a spaceship interior design (picture below), an astronaut lounge, a small scale Disney universe, or a romantic getaway home theater just for two. No need to feature all existent home theater design ideas here and just get people sighing after what they can’t easily have. Instead, it would be way more constructive to teach people what they can do to create their special home theater without investing a fortune. The hardest part is the grand flat screen to project all those lovely movies upon. Actually, we have good news for those who lack the 6 million dollars required for a professional home theater. You can build your own home theater screen in just 10 easy steps. You will use a bit of special paper, powder and a projector. The financial costs will be minimal while the overall video quality will surprise you. Follow the link above and arm yourself with patience and tools. Once you finish building a functional home theater screen things should move on faster. For the next step, go shopping for special furniture that is close as possible to the home theater experience you’re aiming for. 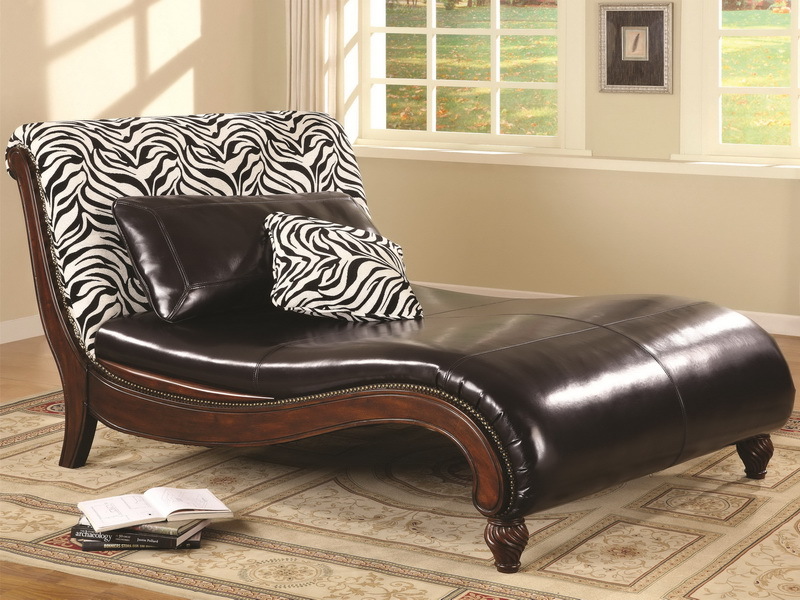 That means, first and foremost, very comfortable leather-bound armchairs and lounge-like chairs. The comfier they look, the better! If you don’t have enough space, only bring them all together in the evenings when you plan to organize a movie night. The rest of the time you can just store them around the house. Replace other furniture items if you must. Comfort is important in a home theater! There are still other necessities to consider after you settle the screen and the seating. You can connect the load speakers to the projector (or the computer running the projector). Last, but not least, don’t forget about the little decorative details to help make the atmosphere really special! Since the whole idea in building a home theater, whether it be a professional or a do-it-yourself design, is to get as much relaxation as possible. Unless the home theater system is really built in the home, you should be able to move it outside in the warm season without much fuss. If the system is self-made in the way presented above, then moving it out in the summer should be even easier to achieve. This kind of activity is actually becoming more and more popular in the United States. Most such initiatives use improvised systems. DIY home theaters don’t make the experience any less magical. Imagine sharing a nice summer evening with friends, all seated comfortably on soft mattresses, lying in the grass of your back yard or by the side of the pool, each with a drink in hand, while the breeze and the night lights contribute to the atmosphere of the nice movie that you’re all watching together on that huge screen. Sounds pretty much like bliss, right? A little precaution you should take though to prevent any stress is to check if all the electronic components are waterproof. If not, to make sure they get waterproofed (you can find some isolating tape in larger general stores). You wouldn’t want some unpredicted session of raining to cut your fun short and ruin your equipment. Other than this, backyard home theater designs are perfectly safe and simpler to build than you think, so start preparing. This summer is going to be quite special. As you can see, with little imagination and effort, you can find many home theater design ideas that can work perfectly well in your space. If you are a fun of DIY, the investment can be minimal. 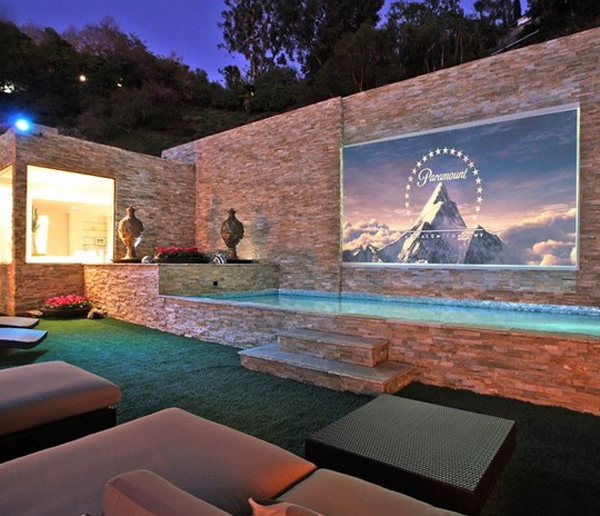 You can even create versatile home theaters, that can be moved out in the backyard, during summer. We hope that our carefully chosen home theater design ideas pictures will inspire you create your cool home cinema!